The most fun way to travel to the Zoo. A great savings bundle including return rocket ferry departing Darling Harbour, Circular Quay or Manly, and entry to Taronga Zoo and Sky Safari cable car! The most fun way to travel to the Zoo including commentary. 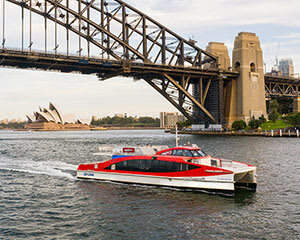 A great savings bundle including return rocket ferry departing Circular Quay, Darling Harbour, ICC Sydney, Barangaroo, Taronga Zoo, Manly, Watsons Bay, Fort Denison, Shark Is & Luna Park and entry to Taronga Zoo and Sky Safari cable car! Sydney's famous Taronga Zoo is located right on the foreshore of Sydney Harbour. The conservation and breeding programmes help to secure future endangered species around the world. And as a reward, the animals and visitors enjoy some of the very best views in all of Sydney.